I’m sure I have nothing new to add to the chorus of writers, bloggers, commentators, and people the world over who have expressed their shock and disbelief over what happened yesterday in Boston. Our community has been violently attacked for reasons beyond all comprehension and innocent people’s lives have been taken and forever changed by an act of pure hatred. Runners and non-runners alike are struggling to come to terms with this senseless tragedy on one of our most hallowed of running days. I am personally heartbroken and cannot fathom the devastation many of you witnessed in person on Boylston Street. It’s difficult to put into words how I feel so I won’t even try except to say I continue to pray for everyone affected in any way by yesterday’s events. It is my sincere hope that you will keep running, keep cheering, and keep supporting each other the way that so many fearless people did yesterday. I take great comfort in seeing my friends out running yesterday and today, hugging and crying and smiling as they pound the pavement. We truly are a Runner Army. I will be toeing the line in Jersey next month and Chicago in June. I hope you will join me in my resolve to show up and run in spite of this new reality we live in. 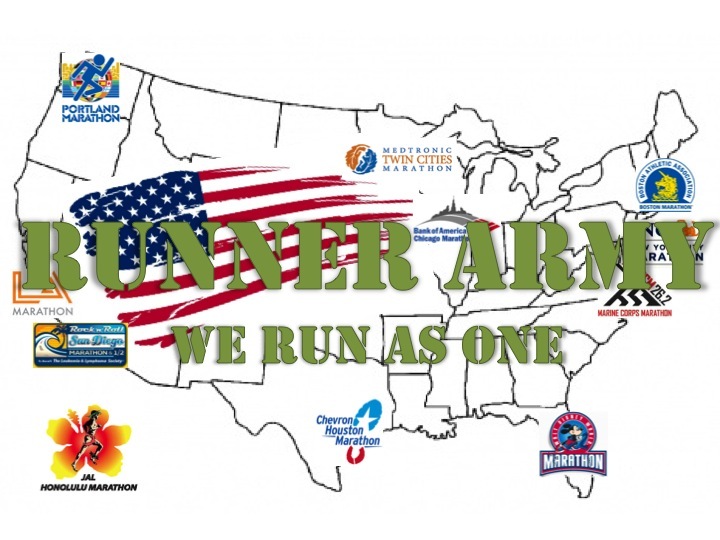 We are the Runner Army and we will not be stopped. And that is a whole Hell of a lot Better Than the Alternative.